The Year of the Dragon is fifth in the 12-year cycle of the Zodiac. The animals on the Chinese lunar calendar were selected and placed numerically by the Jade Emperor. While the dragon may be fifth, it is the most revered animal in Chinese culture. Emperors used the dragon as a symbol of personal strength and military power, while modern Chinese people with good luck and wealth are often associated with the dragon. 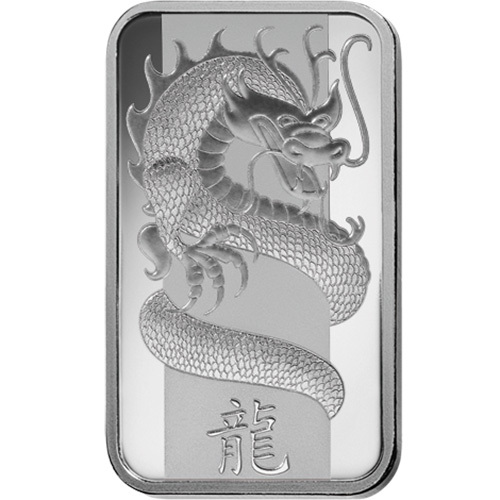 Right now, 1 oz Silver PAMP Suisse Lunar Dragon Bars are available to purchase online at Silver.com. Ships to you inside of protective packaging with an assay card included! 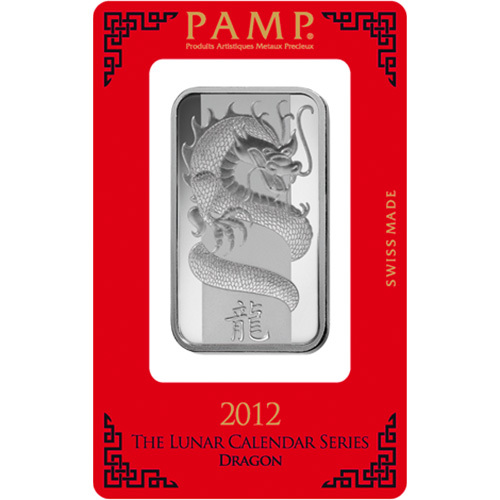 Issued for the 2012 Year of the Dragon by PAMP Suisse! On the obverse is a dragon. The reverse includes a different angle of the same dragon design. Each of the 1 oz Silver PAMP Suisse Lunar Dragon Bars available to purchase today here at Silver.com comes inside of protective packaging. 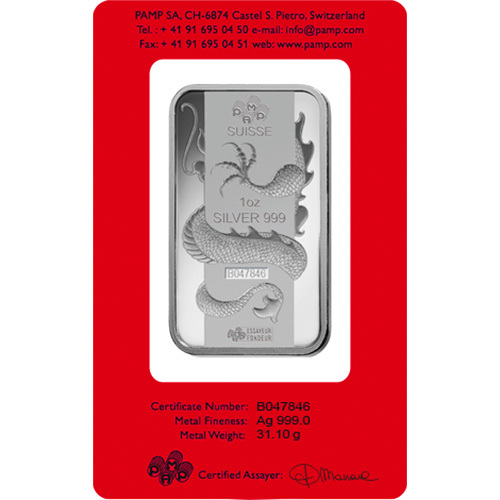 The silver bars are housed inside of protective plastic sealed with a red assay card from PAMP Suisse. The card includes CertiPAMP technology from the refinery that enables you to validate your bar with PAMP Suisse directly. The choice of a red assay card is special in that money is often gifted during the Chinese New Year using red envelopes. Those individuals born in the Year of the Dragon are born under a powerful sign. Such individuals are said to be energetic, warm-hearted, and charismatic. Natural-born leaders, these individuals excel at giving orders and will do what is necessary to remain on top. 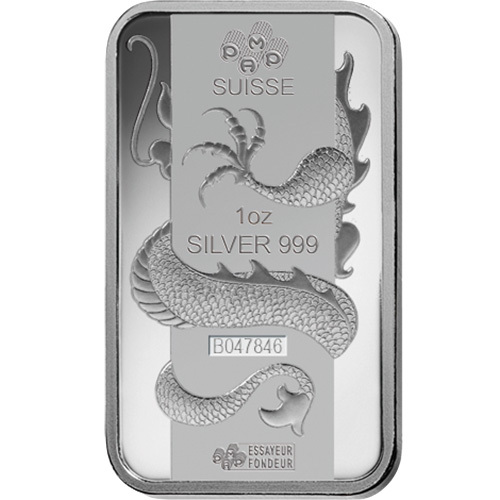 The obverse of 1 oz Silver PAMP Suisse Lunar Dragon Bars includes the image of a dragon winding its body around a pole. The image of the dragon includes its snake-like body wrapped tightly around the pole with its head visible and one of its legs. On the reverse face of Silver PAMP Suisse Lunar Dragon Bars is the opposing view of this beast. The back of the dragon’s head is visible as it wraps around the pole and you can see it using a different leg for stability as it climbs and wraps around the pole. The Year of the Dragon is fifth in the Zodiac because of the dragon’s arrival for a meeting called by the Jade Emperor. Interestingly, Chinese culture depicts dragons as snake-like creatures and the snake arrived to the meeting alongside the dragon. It told the Jade Emperor the dragon was its adoptive father, and as the dragon’s son failed to show for the meeting, the Emperor made the snake sixth behind the dragon. If you have any questions, please contact Silver.com. You can call us at 888-989-7223, chat with us live online, or send us an email.